On December 16, 1999, concretely in Sweden there was apparently an interview with an extraterrestrial creature whose name was Lacerta, I had received many mails asking about this issue, therefore, I also read the lacerta files and I found the story plausible. I had to schedule to ask about this interview as soon as I could, because it was obvious that it was necessary to do it in a whole session and although we are delayed with other questions, finally we could ask about this particular case. Nothing better to transcribe the entire session, because it is very detailed and also very interesting. Ruanel: Yes, It’s me again. Interlocutor: How are you, Master? Ruanel: Fine, with all the energy on, to solve questions, there are many on this planet. Interlocutor: I don’t even dare to ask if you will give a message because I am anxious to ask about something and I’m on tenterhooks for some days. Could we move on directly to the matter? Ruanel: Okay, you can ask. Interlocutor: Good, I received the information from many people about an interview made to a reptilian female which is on the internet under the name of "Lacerta Files" I have read the story and I found it plausible totally because this female who requested that she be called "Lacerta" was a kind of reptilian on Earth, she gave data that only we know, for instance that our planet is not hollow, with similar arguments you explained before to me, and the truthfulness of the "Roswell incident", in which two space ships were involved, etc. In these files there is nonsense too naturally, but I attribute that nobody, not even the more advanced creature knows everything perfectly. Concretely, Was this interview real? Ruanel: Yes, but it was not well channeled. Interlocutor: Channeled? How come channeled? Master, don't destabilize me, please! Ruanel: I say channeled because it was not a "personal interview" but it was made through mediumship. Interlocutor: I don’t understand. Believe me, I am confused. In my mind I thought it was something real. Ruanel: The interview was real, that is to say, with a reptilian creature, but I repeat that it was made through mediumship, it was not "personal"
Interlocutor: Okay, Master, I am totally perplexed because I didn’t even think, in spite of the experience that I supposedly have that it was a channeling. Ruanel: Millions of years ago this planet Earth was dominated by what the scientists called "saurian." Ruanel: That’s right, reptilians. Many died from starvation, others changed their metabolism and they survived. Then, 65 million years ago there was a great cataclysm, in fact it was the second cataclysm, because there was another that occurred 140 million years, and half of the dinosaurs become extinct. Interlocutor: And the other half became extinct because of depredation of other species, genetic code, etc.? Ruanel: No, one half because of the cataclysm 140 million years and the other half due to another cataclysm 65 million years ago. Interlocutor: That is to say that the cataclysms didn't give the chance to the genetic code to complete its cycle and become extinct that races? Ruanel: Not all the genetic code of the species exterminate the race, because there are genetic codes that change, that is to say, mutate adapting the race to the environment. Interlocutor: Wasn't the extinction of the dinosaurs due to the genetic code? Ruanel: Only some races became extinct due to genetic code, not all of them, because, I repeat, some of them mutated. There are hundreds of species different from dinosaurs, the most common are: brontosaurus, diplodocus, stegosaurus, anatosaurs, ankylosaurs, lufengosaurs, gigantosaurs, tyrannosaurs. Ruanel: There were some small races - I am saying small in size since they were similar to the velociraptor, oviraptor and others - that didn't become extinct and through mutations they were adapting to the environment. Interlocutor: Are we also speaking of the tyrannosaur? Ruanel: No, we are speaking of small races, from two meters or two meters and a half. And there were also other races that even nowadays didn’t mutate, like the crocodile. For example, the crocodile has millions of years, and although there were bigger crocodiles before, the crocodile continues existing and its genetic code was not altered in millions of years. Interlocutor: Then the crocodile didn't evolve at all? Ruanel: Correct, not at all. The obvious question is why it didn't evolve; whereas the same human being evolved from very primitive races to what today is the homo sapiens sapiens. The man nowadays is not the same man of 10.000 years ago: his cranial layer has lifted, he has more brain capacity. There are races that, evolutionarily speaking, don't need to mutate, since they are constituted to continue being the same. It is a survival issue. The race adapts just as it is and it goes fine. The crocodile, for example, is an almost invincible predator and it doesn't need to change. Interlocutor: Let’s see if I understood... There are genetic codes that mark the extinction of a race, that is to say birth, development and death. Ruanel: because it is already marked in its code. In fact, that cycle is marked in all species. What happens is that there are genetic codes that can mutate and the race goes adapting to the changes of the environment, of the habitat, and then the moment of extinction is prolonged. Ruanel: The race which the female lizard called “Lacerta” belongs to, comes from the velociraptor and they were mutating throughout time until being what they are today. They were mutating throughout ages until their decoder was getting rich, being more sophisticated, the cerebral cortex was formed, and it could transmit spiritual concepts. At the same time, the very spirit of that velociraptor was also growing conceptually. Interlocutor: And embodying in the same type of organism. Ruanel: Exactly, embodying in the same organism, but more and more evolved. Notice that there were, let us call it "predecessors" of the current human being that barely had the intelligence of the monkey of the present day, and today the human being's decoder has a wider potential. Well, the decoder of this velociraptor evolved and evolved and it ended up being so important and sophisticated that ended up developing abstract thoughts in a superlative way. Keep in mind that the important thing is the abstract concept. Ruanel: And It even had advantages over the anthropoid man of that time. Interlocutor: I cannot believe it! Ruanel: Sure, because the anthropoid man was in his beginnings a quadruped being. Ruanel: Correct, the same thing like the current chimpanzee. Notice that the chimpanzee has two couples of hands, the toes of their feet grab, and so they can move easily through the branches in this way. Ruanel: Well, the Homo sapiens evolved so that he became able to be biped. Interlocutor: To me it is an entire novelty to know that we had begun in four feet. Ruanel: That is known, or it should be known by any biology student, unless his ego and his silliness blinds him, but those reptilians were never quadruped. Interlocutor: Were they always biped? Ruanel: That’s right, because the original velociraptor was biped. Interlocutor: How did they change? Ruanel: Their jaw was reduced, as well as the human being reduced his tail because the primitive man had a small tail. The difference was that the velociraptor had a bigger tail as a counterbalance, because it walked a little bit leaned forward, but he could run at a great speed. Their hands were growing, because the hands of the velociraptor were very small, they were used only to catch their preys, but the velociraptor used more the jaw, and their hands became as big as those of the current homo sapiens. His shape was stylizing, the claws of his feet became subtler, instead of claws they had fingernails, being "more normal." In a certain moment they started using clothes. Interlocutor: How clothes? What are you telling me, Master? Interlocutor: Are you telling me that that velociraptor race manufactured clothes like we make and they wore garments? Ruanel: Yes, I’m saying that. They used garments manufactured by them. Interlocutor: I am totally perplexed!.. Are we always speaking about the ancestors of this female Lacerta? Ruanel: Yes, I am speaking about them. They inhabited the region of Lemuria. In Lemuria there were two races, the race of reptilians and a race of lemurs, which was a race like monkeys, like monkey squirrels, but with a higher mental quotient. Interlocutor: Were the lemurs animal? Ruanel: No, they were not animal. Interlocutor: But at the present time there are lemurs and they are animals! Ruanel: Yes, but the current lemurs don't have anything to do with the lemurs that inhabited Lemuria and became extinct due to genetic code. Ruanel: Well, but the reptilians didn't become extinct and they evolved, they even built ships. Interlocutor: I can hardly believe it! Are you telling me that native animals on Earth evolved and they built space machines? Ruanel: Yes, I am saying that, but from a million years ago or even more. Interlocutor: And where did they live? Ruanel: They lived in different islands, one of them was Lemuria. Interlocutor: And where was Lemuria located? Ruanel: Lemuria was near the Indian Ocean. At the moment it is missing. Interlocutor: Was it really an island? Interlocutor: Was it a continent, then? Ruanel: No, it was much smaller that a continent. Ruanel: No, much smaller. Australia almost has 8 million Km 2. Ruanel: The velociraptor continued evolving and seeing how other races of anthropoid monkeys were evolving, but they wanted to conquer other worlds and so they did. Interlocutor: where did they go? Ruanel: They arrived to Alpha Centaur and they settled down in a planet of this system, in fact Alpha Centaur IV. Interlocutor: Believe me, I am totally amazed. I didn’t imagined that an animal race was practically the owner of the planet and they manufactured space ships to conquer other worlds. Ruanel: When the big cataclysms happened. As well as the so called volcano Krakatoa, at the East of Java, which erupted and destroyed completely an island, there was also a great volcano that buried Lemuria. Interlocutor: Are we always speaking of natural causes? Interlocutor: There is something I don't understand. If Lemuria collapsed completely and nobody was left, how could the current race of reptilians of the female Lacerta exist? Ruanel: The lizard beings abandoned the planet Earth with their space ships. Interlocutor: Master, I will repeat the concepts to see if I understood all this matter: beings belonging to the animal Kingdom manufactured, 3, 4 or 5 million years ago space ships and before the cataclysms happened in Lemuria where they lived, they left the planet to conquer other worlds. Ruanel: Exactly. They had a ship of up to 20 Km long [12.42 mi]. which was orbiting the Moon. Interlocutor: Why did they keep it orbiting? Ruanel: They knew that Lemuria was a very unstable island and that in any moment a cataclysm could happen and make it disappear. And while the other parts of the Earth were already inhabited by anthropoids, they didn't want to invade them, something that they would have done if they wanted to survive. Interlocutor: Were they so ethical? Ruanel: Yes, they were really, very ethical. Interlocutor: Did they have only a space ship? Ruanel: They had a big space ship, but hundreds of small ships of 30 - 40 m [98.4 - 131.23 ft]. Interlocutor: Was the space mother ship circular? Ruanel: No, it was elongated. Ruanel: Correct. In that mother ship all the orbital ships went to Alpha Centaur, more precisely to Alpha Centaur IV. Interlocutor: Did all of them leave the planet Earth? Interlocutor: Not even one was left behind? Ruanel: No nobody was left behind, I confirm it to you. But this doesn't mean that they abandoned the Earth forever, because they have returned in many opportunities, and even nowadays they are visiting us. Interlocutor: But do they land on Earth or they stay orbiting the planet with their ships? Interlocutor: Do they have establishments in big caverns or they simply land on deserted places? Ruanel: They have built cities, although in fact they are not "cities." You cannot magnify the things distorting so much the truth. There is no internal structure in the Earth like to have big cities, but big refuges and platforms. These current beings called "Lacerta" are the descendants of those lemurian reptilians and they are the descendants of the velociraptors of 65 million years ago. Interlocutor: Did the reptilians live in caverns in Lemuria? Ruanel: No, they lived directly on the surface without any kind of problems. They had some caverns though. Ruanel: They are oviparous, and until now they are still oviparous. Ruanel: Of course they are! Interlocutor: Are they Good people somehow? Ruanel: Yes, it is a very ethical race. In order to not being seen by the current human beings, they take refuge in caverns, but they don't inhabit the planet Earth, but rather they only visit us. Interlocutor: This whole explanation is worth, because in the interview with the female reptilian Lacerta, she said that they lived on the Earth. Ruanel: It was a mistake of the channeler. He didn’t channeled well only this fact, but also many others. Interlocutor: How was the channeling? I ask it because I have some confusion. According to the report of the interview, the female reptilian Lacerta showed up to a person and this was introduced to another who was the one that made the report. Ruanel: Nothing like that happened, She didn’t come in person nor does she communicated in the way that that report mentions. What happens is that these channelings are so real, obviously induced to that the person who channels doesn't realize that it’s not real but induced in his mind. Interlocutor: How do they do it? Ruanel: They have in their ship very similar machines. Ruanel: No, they are not holographic machines. In these moments I am sending the concept slowly to the vessel so that he can translate it. You already know the translators of idiomatic concepts. Interlocutor: Do you mean to those artifacts used at Area 51 by terrestrials and aliens to communicate to each other? Ruanel: Yes, I mean those. This type of artifacts exist in the whole Galaxy. Well, there are similar artifacts but they are mental amplifiers, where the person can receive telepathic messages, even those who are not mediums. Interlocutor: Is that what happened to these people? Ruanel: Exactly. These people received an induced telepathic channeling by these reptilian beings, notice that they are not extraterrestrial but descendants of terrestrials. Interlocutor: Concretely then, it was not an interview where the body of this reptilian female was there closer to the Interlocutor. Ruanel: She wasn’t present, but rather she was in the ship, and from there she communicated with them. Ruanel: No, not at all, the image was induced telepathically. Interlocutor: Incredible! Did something similar happened to me in the road close to the tunnels of Rioja when I saw two children that asked me water and they never existed except in my mind? Ruanel: It was different, because these people were in a state of semitrance, they were not completely analytic. 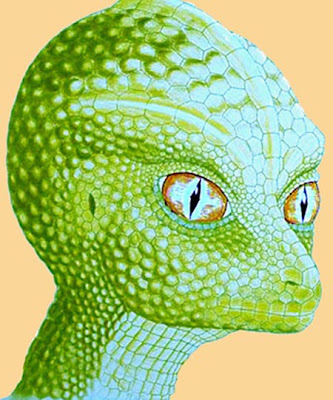 Interlocutor: Did they believe they were speaking in front of the reptilian female Lacerta? Ruanel: Correct, because the experiment was made with both in similar way. Interlocutor: Everything, then, was nothing more than a mental interview? Ruanel: Yes, because she didn't come in person. What happened was that these people distorted totally the message and they mixed truths with falsehoods. The ego of these people contributed to the distortion. Interlocutor: The story about all the channelers is always the same! These people said, for example that the female reptilian Lacerta informed them that the human beings were the product of engineering by aliens called "Elohim." Interlocutor: they are only fantasies then, Don’t these reptilian beings have in the Earth big caverns? Ruanel: Those are fantasies, as to the reptilian beings, they are inhabiting the Earth at the present time in big caverns. There are different caverns, as much in Europe, in Asia, Oceania and Central America, where they have bases, but they don't live there, they only use those caves when they come here to visit. Interlocutor: Concretely, the reptilians are not another race which is living on the Earth together with the homo sapiens sapiens. Is it correct? Ruanel: That’s right, they don't share the planet with the human race. The human beings, at this time, are the "owners" of the planet, to say it somehow, since nobody is owner of anything. Ruanel: There are other reptoids that are extraterrestrials but they don't have nothing to do with Lacerta. Interlocutor: This is also clear. Before of these people, Were there other similar channelings or this was the first? Ruanel: There were many channelings from these reptilian beings, even since the year 1940 that have come out to the light but they were dismissed and they ended up in oblivion. Interlocutor: Transcribing the message of Lacerta in clean, what did they want to transmit to these people and therefore to mankind? Ruanel: They wanted to transmit that the human being is not alone that Lacerta has a great esteem for the human being because they saw him born as a race "in diapers", so to speak. On the other hand, the image that these people perceived in their minds of Lacerta doesn't have nothing to do with reality because they distorted it completely. I will tell you how Lacerta has advanced from Velocirraptor. look for it then in an encyclopedia the image of this animal. The most modern reptilians from 10 to 15 million years, they almost had the tail reduced to the fourth part, they practically had no claws, which became in hands of five fingers like the human being, four fingers and a thumb that operates , many don’t consider it a finger, the claws became nails, their feet have arch, their snout is practically missing, at this moment they have a very small nose, their teeth are no longer from a saurian. Interlocutor: Are you referring to the current Lacerta? Ruanel: Yes, to the current Laserta. The only thing that is different from the human beings is that they have the skin something scaly and greenish and by a test of DNA they could prove they are saurian. Interlocutor: I have a question I almost forgot, like one says commonly, it is related to that female reptilian Lacerta, in the alleged interview she performed demonstrations of telekinesis moving some objects from the table. Ruanel: Everything was mental, there was no telekinesis. But in reality they do have abilities to produce it, it is not that they don't have it. I clarify it , so that there are no doubts that the perception that these people had of the image Lacerta, doesn't belong to the current beings, but to the beings from 15 million years ago, This gives an idea of how these channeleres distorted the message because of the bad function of their decoders. The Current Laserta, as much the male as the female, they are similar to the human, with the difference of the skin and the small tail hardly 10 or 15 cm. [ 3.9 - 5.9 inches] And with a garment it is not even noticed. They have a small protuberance on the ear that even make them look fine, they don't have hair like the human being, they have curved eyes that enlarge and reduce like a rhombus, similar to the cat, they have a night vision very superior to the homo sapiens sapiens, they have a developed sense of smell, their skin is harder, but they have perfectly developed the sense of touch, smell, sound, sight, taste. Ruanel: Their tongue is lightly forked, it is not like the terrestrial snakes. Interlocutor: According to what you are telling me I deduce that they could have been appeared personally instead of mental way. Interlocutor: How is their language? Ruanel: Their language is through sibilant noises. Interlocutor: This means that if they had come in person they wouldn’t have been able to communicate. Ruanel: Correct. They could only communicate if they had an idiomatic universal translator. Interlocutor: Was everything manipulated from the ship, without any physical presence at all? Interlocutor: I had left a pending question Why didn’t Lacerta transmit to them their current image?. Ruanel: Not only they transmitted to them their current image, but also their image from millions of years ago, and these people who think they are prepared for a extraterrestrial contact with this race, they were frightened by the fear, they distorted their vision. Their decoders recorded only the vision from 15 million years ago when Lacerta were not so evolved as they are now. Interlocutor: Was it exclusively a human flaw or something contributed the artifact of the reptilians? Ruanel: It was an exclusive human flaw from the human decoder, because they transmitted to them correctly their current image. Interlocutor: These people say in the report that the Lacerta requested they don't put certain things because they were too incredible. Was it correct? Ruanel: It is something absurd to think that intelligent beings will say things and then request that they don't tell them. Directly they don't say anything and that’s all, especially knowing that the human being is weak and the first thing they will make is to tell the story. Interlocutor: Was an invention of these people, then? Ruanel: Totally, but not of bad faith, but rather they believed to perceive this way. They had their decoders in short circuit. Interlocutor: At this time I don't remember well if there was a recording of the interview. Ruanel: Not there was no recording. Interlocutor: Then I must be confused. Ruanel: If there were a recording they would have already given it to know to the world press. Interlocutor: Since the report it is quite long I should suppose that the "interview" was memorized well. Ruanel: They have good memory, but they have added things on their own, and other things have been distorted totally. The report really has a dose of truth and a dose of nonsense, similarly to the channelings of 90% or more from the mediums. Interlocutor: They say that they have been pursued by this issue, suffering very mysterious and diverse accidents. Is that right? Ruanel: It is pure fantasy product of their Ego. They have not even bear them in mind! Interlocutor: These people say that Lacerta appear in the Bible and that some have confused them with the biblical snake. Ruanel: Everything is nonsense. Besides, the book of Genesis is a myth. Interlocutor: In the "interview" these people asked to take pictures and it seems that the female reptilian Lacerta didn't allow them to take pictures. Ruanel: It is obvious that if they had taken some pictures nothing would have appeared in those pictures. Interlocutor: Now I understand why they didn't want them to take pictures. These people said in the report that the female reptilian told them that there was a religious reason behind. Interlocutor: There is something that maybe it’s not that clear. This female reptilian Lacerta exists or she has been an image induced only and in reality she doesn't exist? Ruanel: She exists, and she herself communicated telepathically with these people. Interlocutor: That is to say that the interview was real, except from that being was not in front of them, but by "phone", to say it in an illustrative way? Interlocutor: Does this female reptilian continue incarnated or she died? Interlocutor: By any chance Is the Thetan of this Lacerta present in this session? Ruanel: Yes, it’s present here. Interlocutor: In Which spiritual plane is she at? Ruanel: It is in a Mastery grade, the 4º vibrational plane. Interlocutor: Concretely, Is a spirit that simply decided to embody in a reptilian being instead of a human being? Ruanel: Just like that. It is a spirit that helps a lot in her world and in other worlds too. There are worlds that are barren and they are capable to shelter life, not necessarily for Lacerta but for other colonies and they transform these planers to make them inhabitable, for example planting trees so that they liberate in this way oxygen and other things. Interlocutor: Well, Master, I believe that the topic is clarified. Would it be something more to add? Interlocutor: See you later, then. Ruanel: All my Light to you. Actually, “Elohim” are Spiritual entities of the 8th Spiritual plane, they are not extraterrestrial beings like the Ha. This entry was posted at Tuesday, September 01, 2009 and is filed under Extraterrestrials . You can follow any responses to this entry through the .